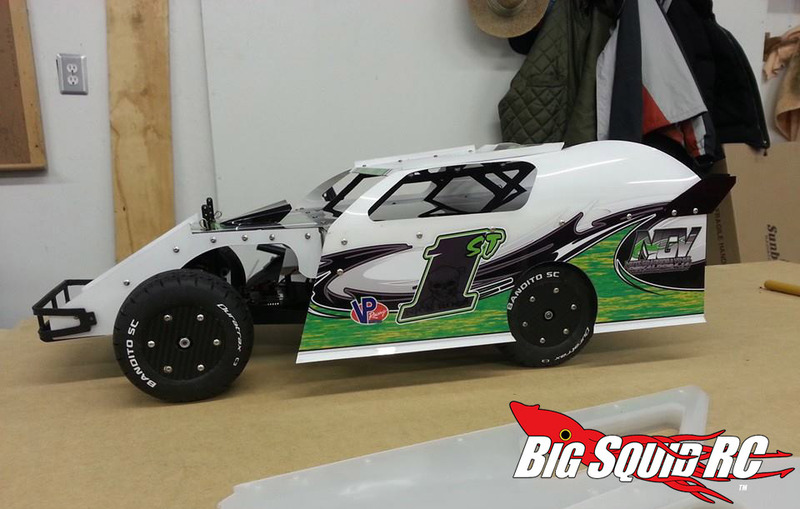 Everybody’s Scalin’ For the Weekend: Pro-Line Pro-2 Dirt Oval Modified: Part 1 « Big Squid RC – RC Car and Truck News, Reviews, Videos, and More! While I haven’t raced in around 4 years, each spring when the weather turns I start getting the itch to build an oval car. Sure, I spent the majority of my “racer days” doing the off-road thing, but once I first went WFO and got sideways with a friend’s open wheel modified I quickly became a convert. 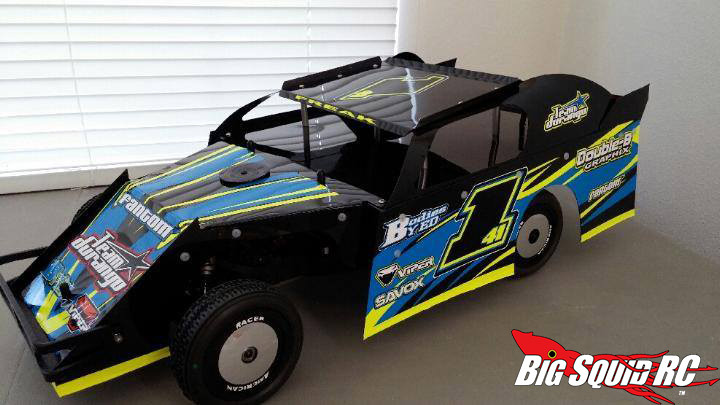 I wound up purchasing a Losi Mini Late Model and enjoyed racing it for a season to get my feet wet. Soon I was involved in a variety of classes and fielding multiple cars before coming down with a nasty case of general racing burnout. I got rid of all my race cars/trucks but always knew I’d be back someday. Let’s get something out of the way; I’m well aware that the thought of racing in a circle sounds very boring to many people. Heck, I won’t really disagree with you….if we are talking asphalt or carpet that is. I subscribe to the thinking”Asphalt is for getting to the track, dirt is for racing.” I love the speed and mayhem that comes with the dirt and I’m a big fan of World of Outlaws racing. I try taking in my local Saturday night short track program whenever I can. 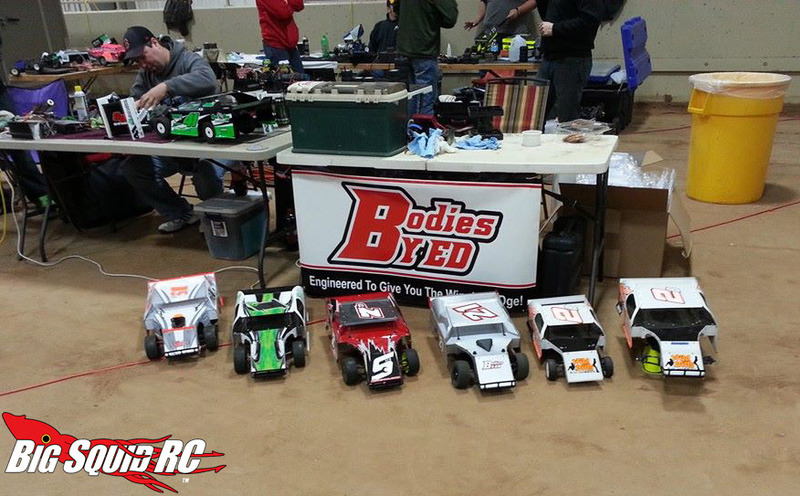 Several longtime buddies of mine own 1:1 cars and battle at tracks across the midwest every weekend (at least as often as their bank accounts will allow). So yeah, I loves me some dirt trackin’. 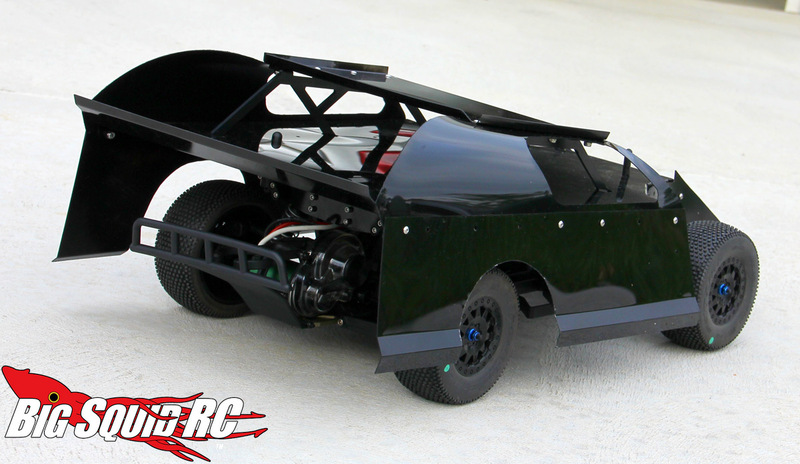 My “stock” Pro-Line Pro-2 Short Course Truck (w/ extended rear body mount) before getting the oval treatment. 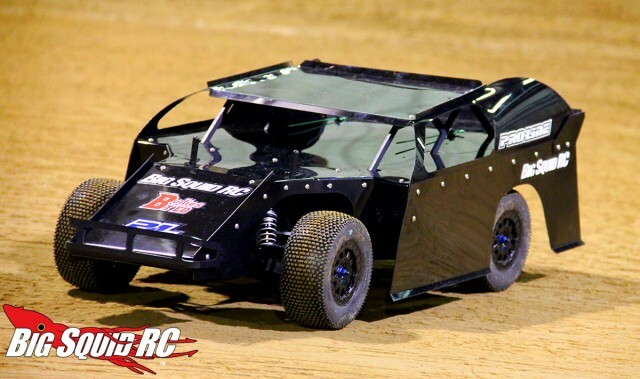 As it pertains to this piece, my home region (St. Louis, MO) is a hotbed of r/c dirt oval racing and every year it seems another track springs up. I can count 4 really nice ones within about an hours driving distance from me. All of them have very active communities and *gasp* are super accommodating to noobs (gee, I can’t imagine why they are successful). 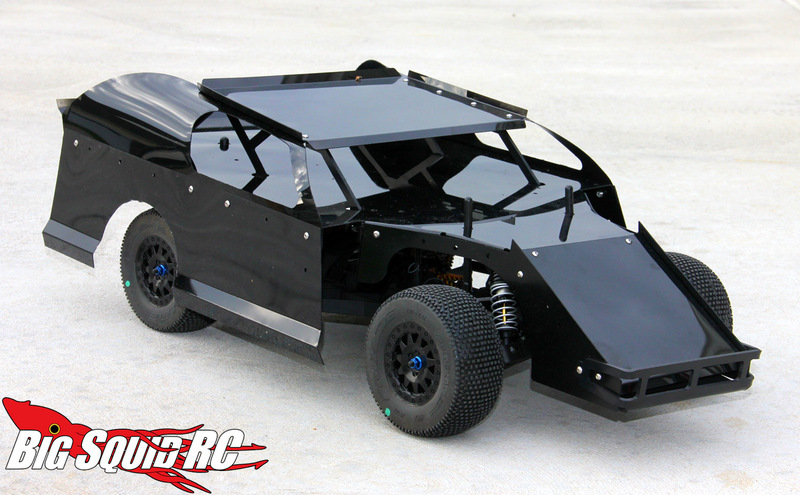 While sprint cars and late models are really popular (Custom Works, Murfdogg, and Hyperdrive are a few popular manufacturers) I’m particularly drawn to the open wheel modified short course class. Some of the constant gripes you hear about off-road SC racing (the trucks are too big, races are too rough, etc) are precisely why they’ve caught on like wild fire as a DO class. 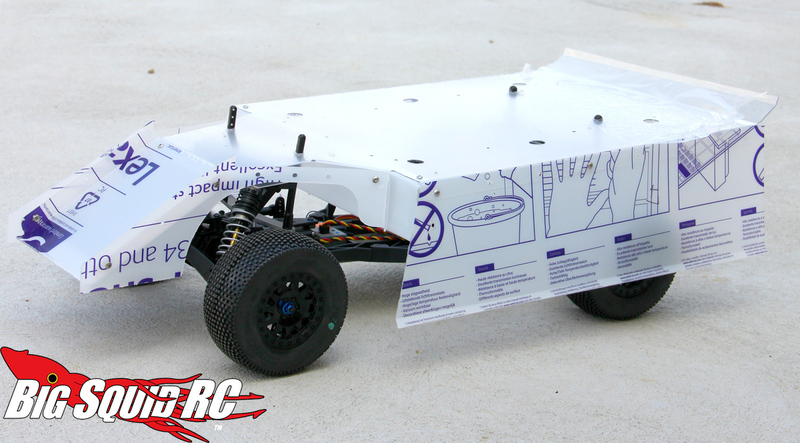 The vehicles are easy to convert and look scale as they carve their way around the track. They are a blast to drive and are known for being a rubbin’ is racin’ type of wild class. You have to go into a race fully expecting contact and know how to deal with it. Given that the vehicles are normally packing big power, the wrecks are often spectacular. And while pretty much any short course truck can be converted to a modified car, my weapon of choice is a Pro-Line Pro-2 topped by a BBE (Bodies by Ed) modified body. Click the “Read More” below to read the full article. We’ve written a lot about the Pro-2 and are big fans of it (see our review of the vehicle here, buggy conversion here) so I won’t say much about the standard kit here. Suffice it to say though, it went together easily and is of very high quality. Compared to the last short course truck I owned, a stock Traxxas Slash, this thing is a spaceship and handles like a dream. 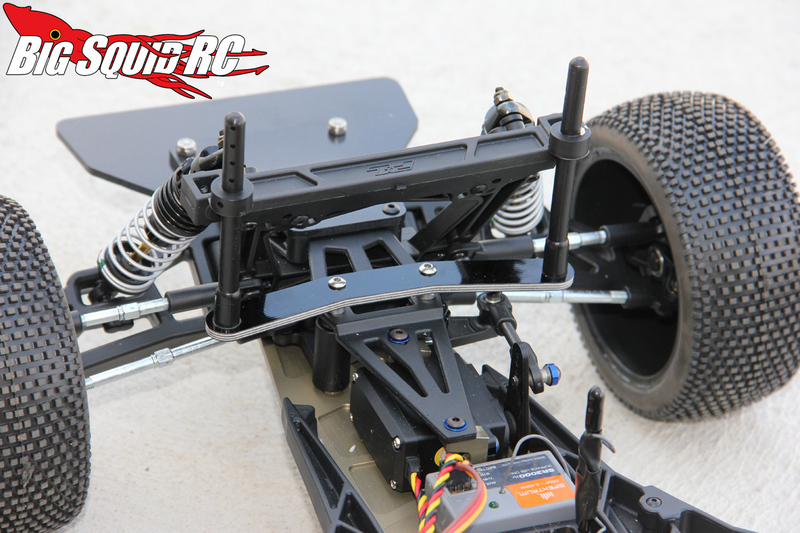 I’m using a Castle 6900 kv Mamba Max Pro system on 2S and the transmission/diff handles it without breaking a sweat. As I mentioned, the world of short course oval racing is home to lots of paint swappin’ and crazy wrecks so the proven durability of the platform will be a huge plus. 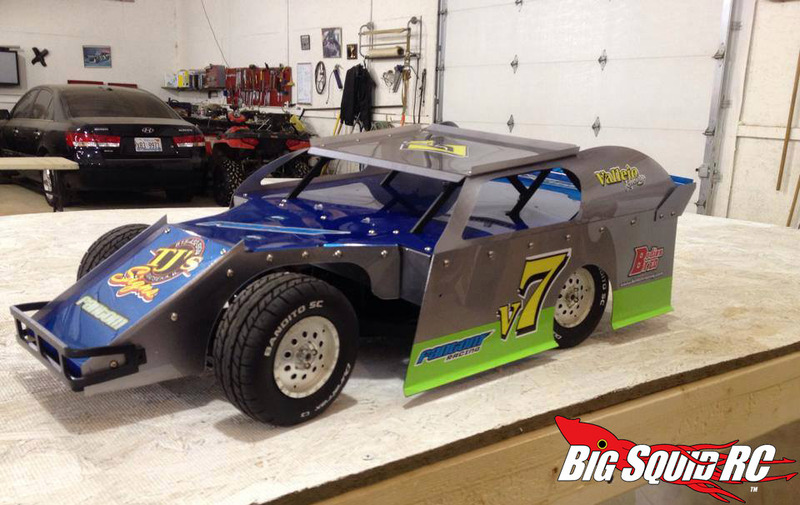 As short course dirt modified racing’s popularity grows every year, so do the amount of body kit builders. I wound up going with a BBE modified kit because they have a rep for building quality stuff and make the setup as easy as possible. Ed (owner) was very accommodating to all of my questions, and since I’ve been out of the game for so long I had a bunch. 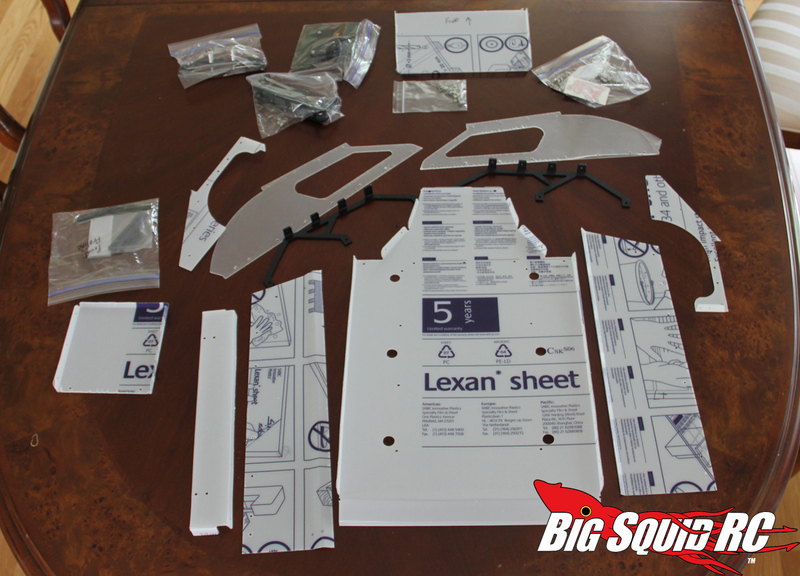 Each kit comes completely un-assembled and includes the individual lexan pieces, stainless hardware, body mounts and bumpers. BBE offers getups for most of the popular SCT’s (i.e. 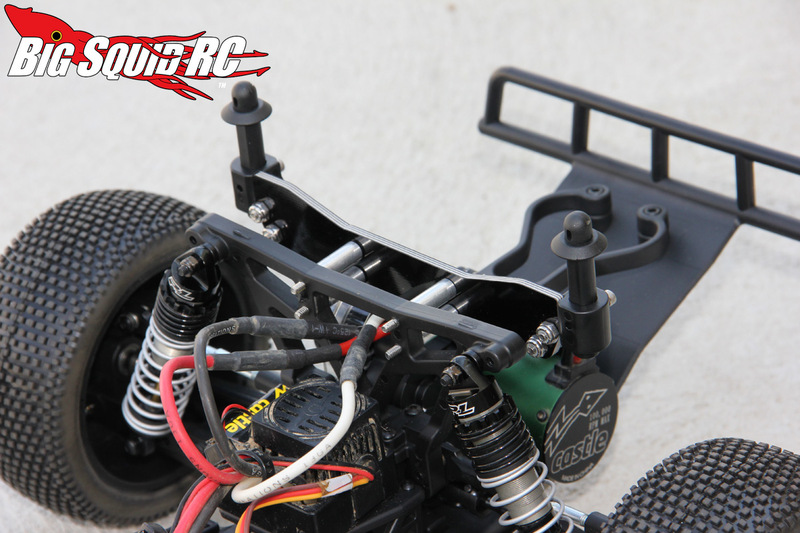 Associated SC10, Traxxas Slash, TLR 22SCT) and if you send them measurements they can do any kit you’d like. As you can see in the pic below, there are a lot of pieces that go into one of these things. 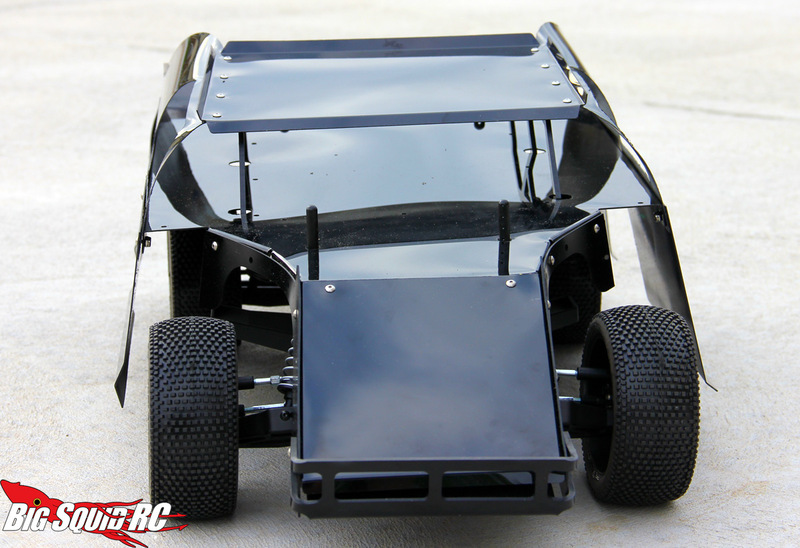 I’ve also included shots of the new front bumper, body mounts, and a quick mockup with the main body assembly test fitted. 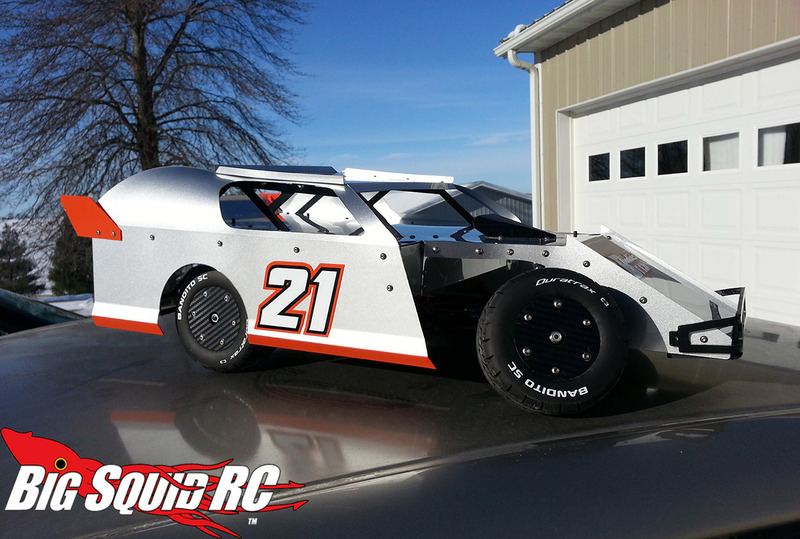 The body is going to get a slick red/black/white Big Squid RC themed vinyl wrap courtesy of Derek @ CustomRCWraps.com, but in the meantime it still needed a base coat of black laid down. After everything dried I loosely put it together for a final mockup (and a rough cut on the rear wheel wells). 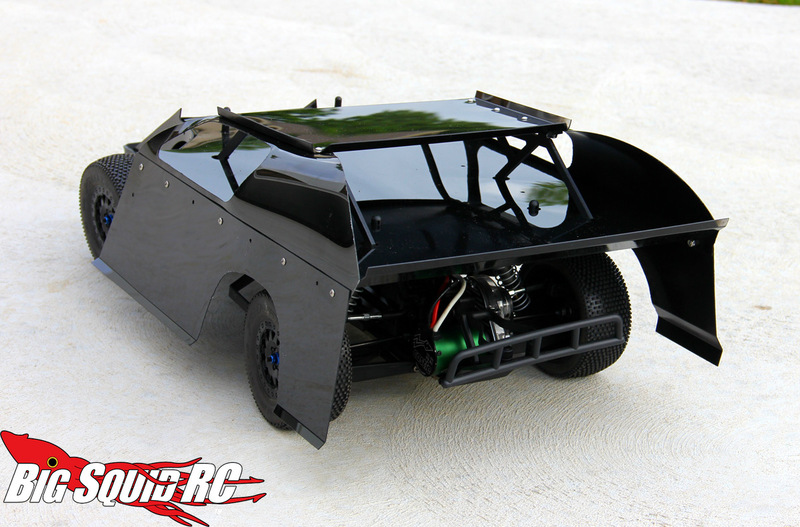 A new body will always change the look of an r/c but in this case it REALLY does. In the next installment of this series the vinyl wrap will be applied and I’ll be tearing up the local r/c speedway on a race night. That’s when we’ll talk suspension and how oval requires a tweaked setup from standard off-road use. Here’s a small spoiler; after finishing the initial build I took it to the local track for a practice night so I could iron out the kinks without wrecking others (it’s where I took the headline picture at the top of this page) and surprisingly the car was already close to dialed. I was also happy to find out that I still remembered how to turn left. Before we go, here’s a shot of what the wrap’s gonna look like. Until next time! 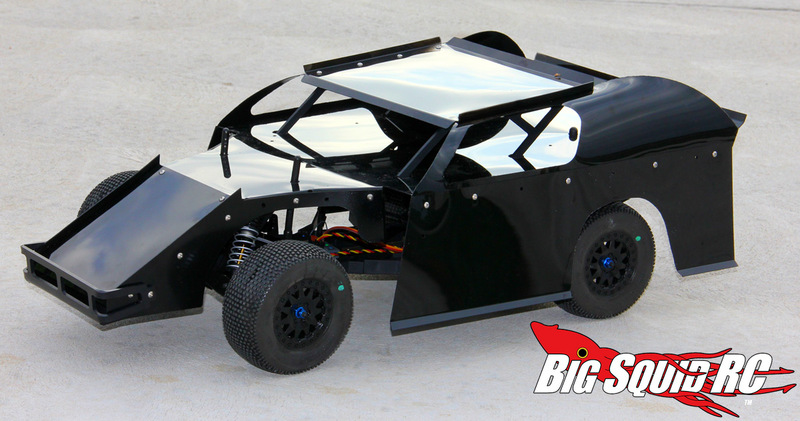 For more Pro-Line news on Big Squid you can click right here. 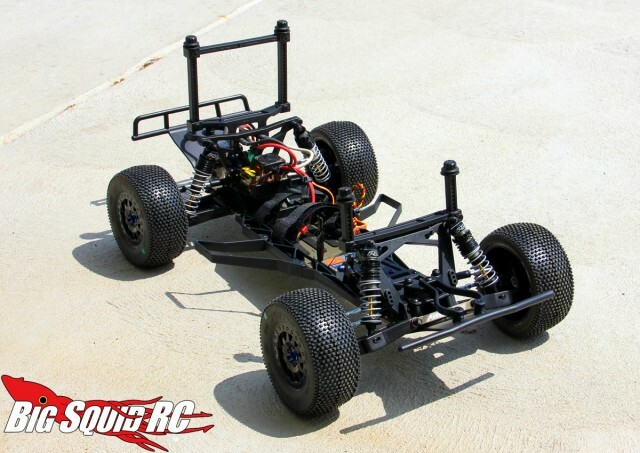 For more scale r/c news hit up this link.